Little did he know he would be accused of blasphemy by his fellow students when he showed up for class at Abdul Wali Khan University Mardan on April 13, 2017. There was no response from Mashal Khan. That was his fault: he was different. Even though there are several common elements in incidents involving blasphemy, the specific details of each episode vary. What distinguished Mashal Khan’s case is that his violent murder for a sin he did not commit ignited a flame in our hearts, a flame of anguish over injustices committed in the name of faith, a flame for a desire to change it all. On a lesser level, he has us all – well, almost all – voting for him as the Herald’s Person of the Year 2017. Similar to our Person of the Year in 2014 and 2015, here again we find ourselves voting for another victim, another casualty. Except this time the victim was falsely accused of blasphemy and was not a fatality of a terrorist act. Why should we be stunned at this violence disguised as virtue? After all, the path to Mashal Khan’s murder is dotted with many a milestone indicating where we have ultimately been led: a Christian convert from Islam, Tahir Iqbal, was found dead in jail in 1992 after being accused of abusing the Prophet of Islam; Hafiz Farooq Sajjad was stoned to death after a Quran in his house caught fire in 1994; in 1997, Justice Arif Iqbal Bhatti was assassinated for exonerating Salamat Masih, a Christian who was accussed of blasphemy when he was about 12 years old; Muhammad Yousuf Ali was shot dead in Lahore prison in 2002 where he was serving his sentence for supposedly committing blasphemy; Samuel Masih, who was in police custody over blasphemy charges, was hammered to death by a police officer in 2003 who claimed it was his duty as a Muslim to kill someone who had blasphemed; in 2011, Punjab governor Salman Taseer was assassinated by his bodyguard for voicing his opinion on the blasphemy law and supporting Asia Bibi, a convict under that law. These are just some of the many incidents that shook us all to the core. And yet they happen again and again. This recurrence makes Mashal Khan’s assassination all the more significant. If we have not learned to mend our collective ways after his murder, when will we ever? If his lynching for something he did not even commit does not change our thinking, what will? Mashal Khan is the Herald’s Person of the Year in 2017, signifying both our rage at our own failure to rectify our behaviour and our protest at how the laws of the land are constantly misused and abused with impunity in the name of religion to suppress differences of opinion. 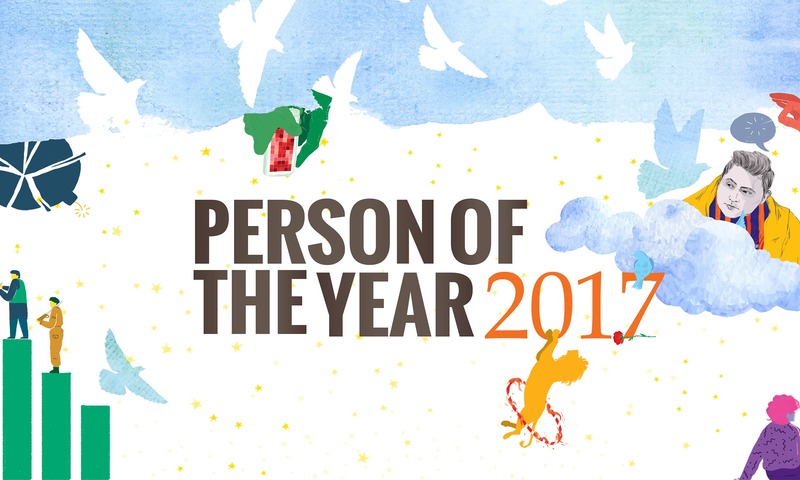 Our Person of the Year segment is neither a popularity contest nor is it an alternate to national elections. It is just a measure of how much news coverage various individuals and issues get in a calendar year. This is not to undermine the fact that, at the end of the day, people see what they want to see. And that explains why we have put in place an elaborate process to finalise our Person of the Year. It starts with a negative selection in which many nominees get eliminated because there cannot be more than ten of them. The conversation begins in early September, when the Herald’s editorial staff start to nominate their candidates. These suggestions and many others, randomly chosen from media coverage, are then brought together in an all-staff meeting. This past year we heard passionate cases for Maryam Nawaz, Sharmeen Obaid-Chinoy and everyone in between. An online poll is another important part of the process, though it is decidedly limited in its coverage since it is mostly taken by English-reading audiences of the various online platforms of the Dawn Media Group, including the Herald. Sometimes, the respondents include a large number of expatriates and even foreigners. They are also predominantly urban males. 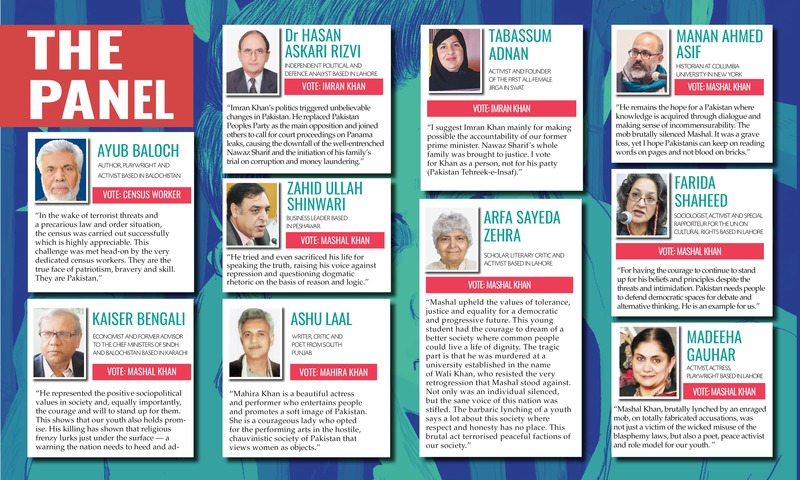 To make up for some of these problems, we have a panel of 10 eminent Pakistanis who bring in authoritative voices and lend intellectual weight to the selection process. They include people from different genders, areas and professions. To make the process even more representative and inclusive, this time around we carried out a public opinion survey across Pakistan on the basis of a demographic sample stratified at four levels: province, gender, mother language and location. The sample, consisting of more than 1,500 Pakistanis, was derived from the latest available official data (collected in the 2017 census) and its field work was carried out by a large team of surveyors in 36 districts in early December. The ground survey made it apparent that, for most Pakistanis, politics remains the biggest news story and politicians the biggest news makers. 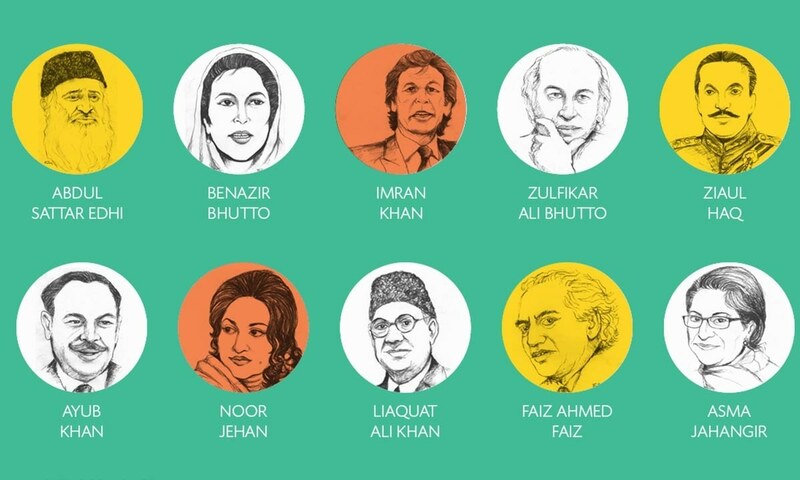 Three people who together won more than 75 per cent of votes – Imran Khan, Nawaz Sharif and Justice Asif Saeed Khosa – represent most of the various shades of Pakistan’s politics in 2017. Hardly anyone voted for the bloggers who went missing in January 2017. Perhaps just a few remembered what happened to them by the year’s end. 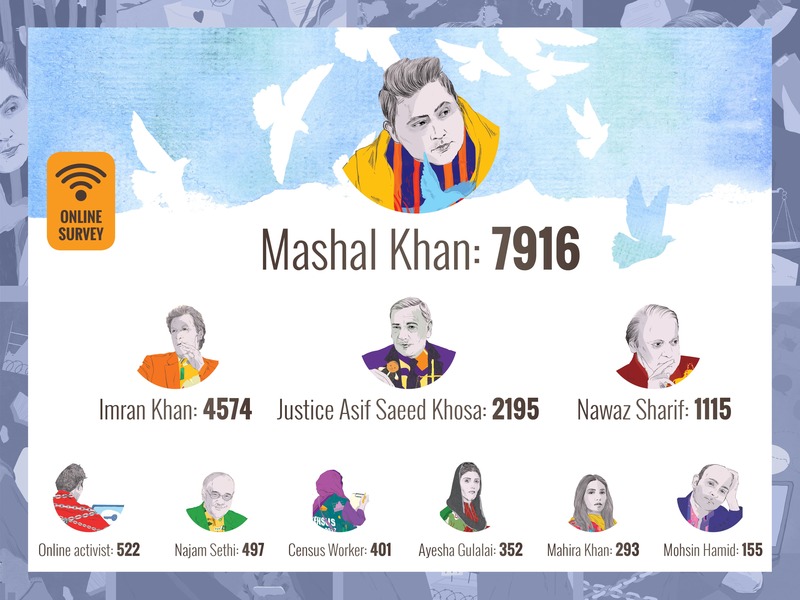 Even Mashal Khan received only about six per cent of the ground survey votes. 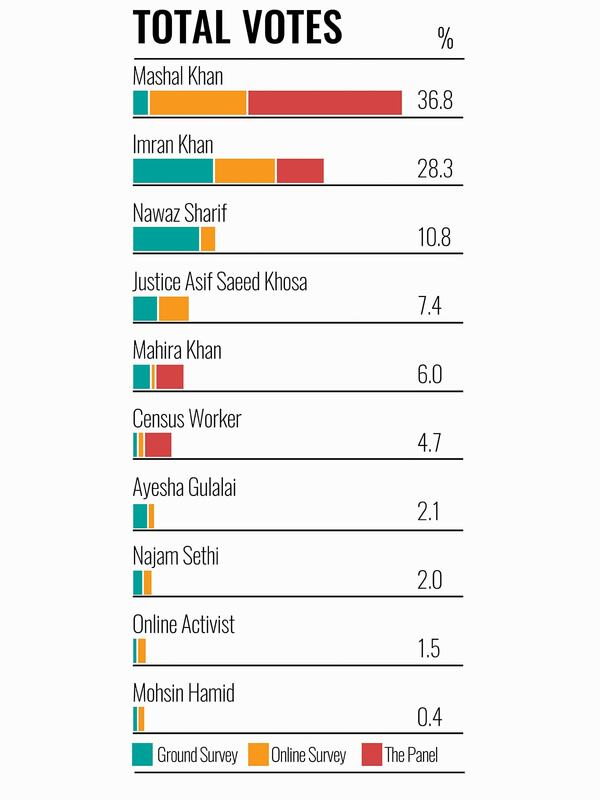 The census worker, who represented perhaps the largest government campaign in recent years, also did not register on the radar of most respondents. 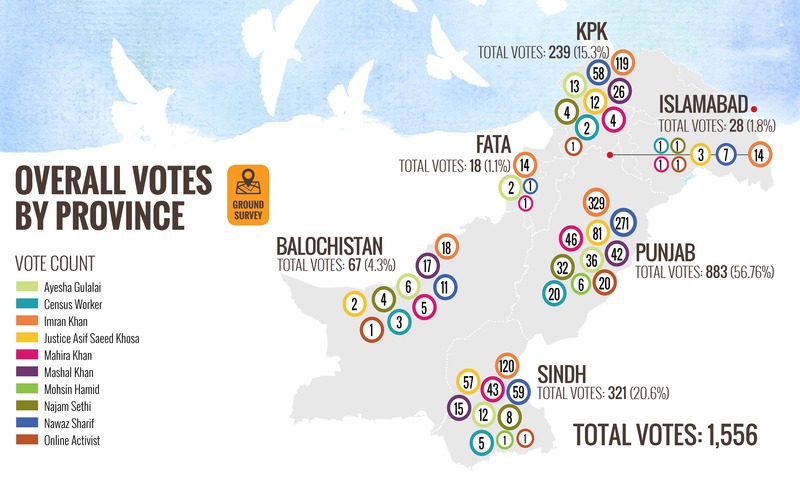 Mohsin Hamid, Najam Sethi and Ayesha Gulalai are some other nominees who together garnered roughly seven per cent of votes (as compared to Mahira Khan who alone received 6.52 per cent of votes). Hamid was shortlisted for the Man Booker Prize 2017 and has received international acclaim for his books but those voting in our field surveys do not see him anywhere among the top news makers in 2017. 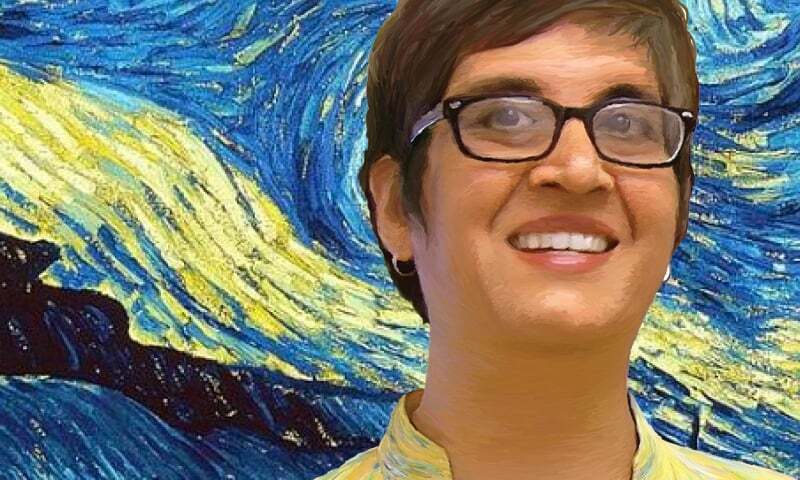 The same goes for Ayesha Gulalai, who was reviled profusely on social media both before and after we posted our Person of the Year nominees for our online survey. Even Najam Sethi, who is a well-recognised cricket manager, has failed to make the cut in an otherwise cricket-crazy country. Earlier this year, when five activist bloggers went missing, a hateful campaign was waged against them that accused them of blasphemy. None of them were taken to court. They were, instead, taken away by security officials to unknown destinations. A court in Islamabad was recently told that they had committed no blasphemy but the damage to their reputation had been done. Four of them have already left Pakistan. Others are lying low for understandable reasons of personal safety. In a year that started with their disappearance and culminated in a frenzied mob’s siege of Islamabad, they are not the only ones feeling insecure. Mashal Khan, we miss you. Our nation Pakistan has a lot to answer for its creation. Mashal Khan, there are few people who change the way of thinking in a society. In your young age of just 23 you have already achieved that. Fewer people still remember the name of someone deceased long after their passing. Though I suspect your name and story will be remembered to remind the world of evil people trying to subjugate the will of us normal people. Rest assured we will win in the end. @akram "Rest assured we will win in the end" before that happens how many precious and innocent lives like Mashal will the world lose. Why cannot the will of normal people be heard, why cannot normal people live in peace, in this country. Why did we have to lose thousands of innocent lives to terrorism, men women and children, innocent and wonderful people like Mashal. The next election should be online only, and the election commission should have this panel.